The 24 GHz transverter along with the described 10 MHz frequency reference. Stability is important as a drift of even a few hundred Hz at the operating frequency (in the GHz range!) can affect intelligibility of voice - or, if CW is being used for weak-signal work, such drifting can move the received signal outside the receiver's passband filter! Having to "chase" the frequency around is not only distracting, but it complicates being able to communicate in the first place. Accuracy is also important because it is important that both parties be confident that their operating frequencies are reasonably close. If a contact is arranged beforehand it is vital that both parties be able to find each other simply by knowing the intended frequency of communication and as long as the two parties are within several hundred Hz of each other it is likely that they will be able to find each other if the path "works" in the first place. If the error was on the order of several kHz, "hunting" would be required to find the signal and if those signals are weak, they may be missed entirely. Because achieving such stability and accuracy requires some effort, it is more convenient if our gear is constructed such that it can use a common, external frequency reference and lock to it: In that way, we need only have one "master" reference rather than several individual references. Having one common frequency reference can also be convenient if one is operating portable using battery power since it can mean that one doesn't need to keep all of those individual pieces of gear "warmed up" all of the time to maintain stability. 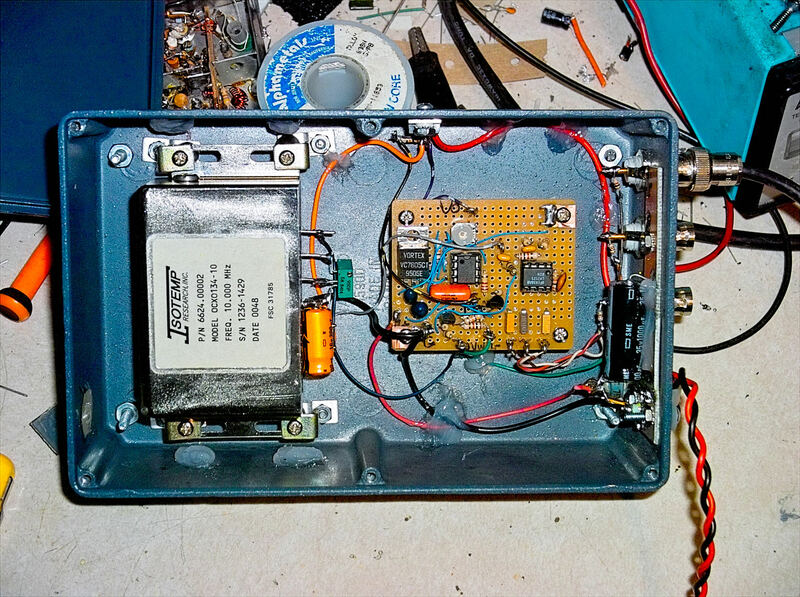 If a particular piece of gear can accept an external 10 MHz input, this would allow one to it on (and drain battery power) only when it is needed. 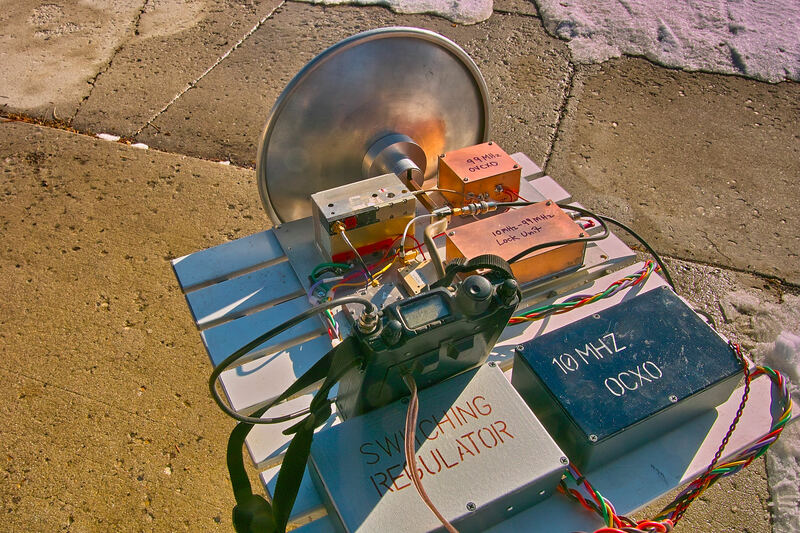 The goal for this project was to have a "reasonably stable and accurate" reference: Based on an Isotemp OCXO 134-10, this unit seems to be able to hold the 24 GHz local oscillator to within 500 Hz or better once it has had 15-20 minutes or so to warm up - and it seems to be fairly stable across a range ambient temperatures from "hot" to "below freezing." The Isotemp unit - and others like it - are readily available on both the new and surplus markets, available via EvilBay and similar. The oven module itself is rated to operate from 13 volts, +/- 2 volts, implying a minimum of 11.0 volts. Even though testing indicated that it seemed to be "happy" with a supply voltage as low as 9.8 volts or so, it was decided to adhere to the published specifications and in looking around I noticed that most readily-available low-dropout regulators (and those that I had onhand) were not specified to handle the maximum "cold" current of this oven - about 800 mA or so - so I had to "roll my own" 11 volt "zero-dropout" regulator. More on alternative regulators, below. Why regulate? I noted in testing that slight variations of supply voltage (a few hundred millivolts) would cause measurable disturbances in the oscillator frequency due to the changes of the power applied to the heater, taking several minutes to again reach equilibrium. Since battery operation was anticipated it is expected that the supply voltage would change frequently - between periods of transmit and receive - as well as due to normal battery discharge. Referring to the schematic, U101 - a standard 5 volt regulator (the lower-power 78L05 is a good choice) provides a stable voltage reference for U103, a 741 op amp, which is used as an error amplifier. A 7805 was chosen as it is readily-available but a Zener diode and resistor could have been chosen: If a Zener is used, a 5.6-6.2 volt unit is recommended with 2-5 milliamps of bias as this voltage range offers good temperature stability. If the output voltage is too low, the voltage on pin 3 drops as well - along with the pin 6, the op amp's output which turns on Q103, a P-Channel power MOSFET, which increases the voltage and once the voltage on the wiper of R119 reaches 5 volts - that of the reference - the circuit comes to equilibrium. A P-Channel FET (a less-common device) was used because it takes 3-5 volts of drain-gate voltage to turn on a FET and it would have been necessary to have at least 16 volt supply to bias the gate if an N-Channel FET were used. Furthermore, with the use of a P-Channel power MOSFET the dropout voltage of the regulator is essentially limited to the channel resistance of the that FET. In theory a PNP (possibly a Darlington-type arrangement) could be used instead if one can tolerate closer to a volt of dropout, but the FET was chosen to minimize the dropout voltage. In testing, once the oven was warm (a condition in which the OCXO was drawing approximately 250 mA at normal "room temperature") the dropout of the regulator was approximately 50 millivolts - a voltage drop that is likely to be comparable that of the resistance of the wires used to power the unit. This rather simple regulator seems to work quite well, holding the output voltage steady to within a few millivolts over the input voltage range of 11.1 to 17 volts with good transient response. This OCXO has a "status" output that, when "cold", outputs about 0 volts and in this state, Q101 is turned off, allowing R112 and R113/D102 to pull its collector high - turning on Q102 - which pulls the gate of Q103 low through R118, turning it fully "on." In this state the voltage applied to the oven is nearly that of the battery supply and this higher voltage increases the power applied to the oven, allowing it to heat more quickly. Once the oven's "status" line goes high, Q101 is turned on, illuminating the LED and turning off Q102, allowing the regulator to operate normally. Note: When the unit is warming up, the OCXO's voltage is unregulated which means that the supply should be kept below 15.0 volts to stay within the "safe zone" of the ratings of the oscillator itself. Does the "boosted" voltage actually help the oven warm up faster? It's hard to say, but it took only 4 additional components to add this feature! Top Right: End-view of the OCXO module showing the output jacks, the "Status" LED and the power connection. Bottom Left: A close-up view of the oven and its shock mounts. Bottom Right: Schematic of the OCXO module. It should be noted that this status line doesn't indicate that the oven has fully warmed up, but that it's still warming: At "room temperature" it takes at least another 5 minutes before the frequency will be stable enough for use and another 5 minutes or so after that until it's "pretty close" to the intended frequency and it can be used at microwave frequencies without having to chase people around. Why have the indicator light if it doesn't indicate that the unit is "ready"? If the light isn't on, you can be sure that the frequency output won't be valid for one reason or another. Because the OCXO itself is somewhat load-sensitive, U102 - an LM7171 - is used as a distribution amplifier to both isolate the oven from its loads and to provide fan-out to allow multiple outputs to be driven simultaneously. The LM7171, a high-output, high-speed op amp, is configured for a gain of 2, providing about 2 volts peak-to-peak output with the drive provided by the OCXO. Because this unit is intended to be used "in the field" it was decided to mount the OCXO module itself to prevent mechanical shock from affecting the reliability, frequency stability and accuracy and this was done using some rubberized mounting pillars from scrapped satellite equipment while some "blobs" of silicone were placed on the wall of the die-cast enclosure to prevent the OCXO housing itself from directly impacting it should the unit be accidentally dropped. A few bits of stiff foam could also be used to provide some shock mounting in the corners of the OCXO but be aware that some oven-based oscillators have been known to become less accurate and stable if they are over-insulated, so don't go overboard. Like any crystal oscillator, it is somewhat "position sensitive" in that a frequency shift of a hundred Hz or so (at 24 GHz) can be observed if the unit is placed on its side, upside-down, etc. While this effect is very minor, it's worth noting when it's being set to frequency and in operation. Finally, the input supply is RF-bypassed using a feedthrough capacitor to prevent the ingress or egress of extraneous RF along the power lead. For power-supply short-circuit and reverse-polarity protection, R101, a 1.1 amp, self-resetting PTC fuse is used in conjunction with D101, a 3-amp diode. Since this web page was originally put together a number of "low-dropout" adjustable regulator ICs have appeared on the market that may be suitable for your this project - but there are a few caveats. For example, there is the Linear Technologies LT1086-Adj which is rated for up to 1.5 amps of current. While much lower dropout than a conventional adjustable regulator such as an LM317, it does have approximately 1 volt of dropout which means that if you set the OCXO's supply voltage to 11.0 volts - the minimum recommended in the specification - your battery voltage must be at least 12.0 volts: While this represents a lead-acid battery that mostly depleted it is likely that a small, but healthy, lead acid could drop to such a voltage under transmit load - particularly if the resistance of power leads is taken into account. This 3-terminal regulator is used in a manner very similar to the LM317 - except that you really must have some good quality, low-ESR capacitors (probaby tantalum) very close to the regulator itself - see the data sheet. Also made by Linear Technologies is the LT1528 that is rated for up to 3 amps that has a (nominal) 0.6 volts of dropout - more typically in the 0.3 to 0.5 volt area for the amount of current consumed by the OCXO, particularly once it has warmed up: This extra margin would keep one in the "safe" region of the OCXO's operating voltage range down to around 11.5 volts allowing both "deeper" battery discharge and more voltage drop on connecting wires. 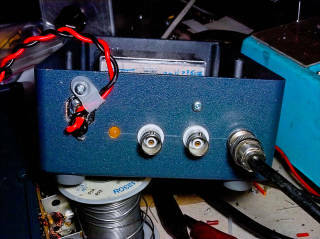 This part is somewhat more complicated to use than the LT1086, above, but it is, overall, simpler than the op-amp based regulator described earlier in this page. If the "fast warmup" were to be implemented on either of the above regulators it would take a different form than the above - likely using several resistors and a transistor or two to "switch" the resistor-programmed voltage setting to something higher than the normal voltage. 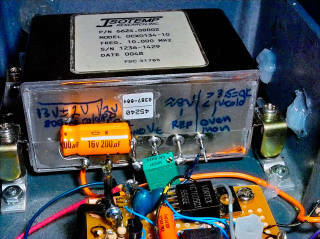 There are a number of other, similar, low-dropout regulators that are made by different manufacturers, but very few have as low dropout as the FET/Op-amp circuit described on this page. It is recommended that one not use a switching regulator to power the OCXO unless it has been extremely well filtered and bypassed. Refer to the sorts of techniques used with the Rubidium references found elsewhere on this web page for suggestion. If you are interested in an example of this project being built with an etched PC board with surface-mount parts, visit VK4ABC's 10 MHz OCXO Web Page.